Japanese kitchen knives have a worldwide reputation for excellent quality and artistic beauty. The trouble is, there’s so much mythology and romance surrounding them, not to mention a bewilderingly wide range of prices and types, that it can be difficult to make a choice. The first thing you should ask yourself is how much time and effort you’re willing to put into taking care of your knives. The answer to this will dictate the knife material you should choose. 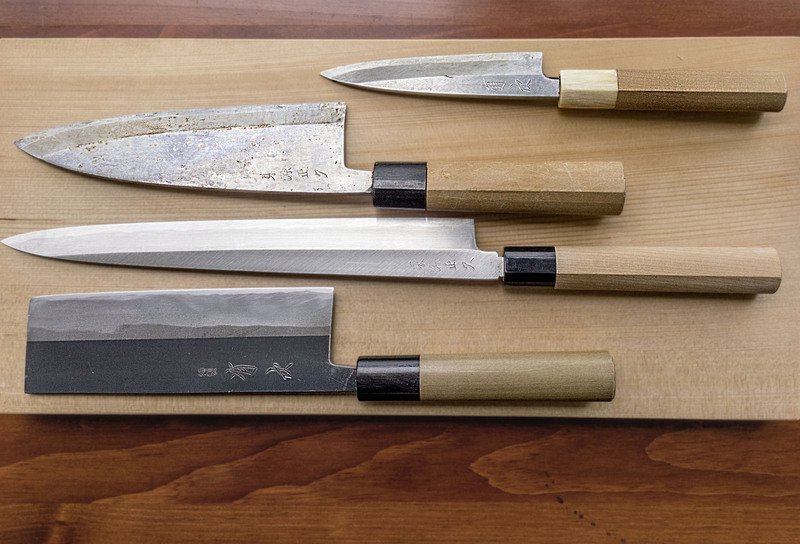 Japanese knives are traditionally made with a type of carbon steel called hagane, which comes in various gradations. Cutting implements made with hagane can hold an extremely sharp edge, which is why this material was also used to forge Nihontō (samurai swords). However, hagane is a relatively soft steel that’s meant to be maintained regularly; professional chefs sharpen and take care of their knives every day, but a hagane blade that’s not maintained regularly will dull, chip and rust. The other major consideration when looking at knives is whether to choose a single- or double-bevel blade. Most traditional Japanese-style knives have a wide, deep-angle bevel on one side of the blade, while Western-style knives as well as the most popular modern Japanese knife types have a shallow, narrow bevel on both sides of the blade. Double-bevel knives are also generally thinner and lighter than single-bevel knives of similar size. For home use, a double-bevel blade is usually easier to handle, and they aren’t too difficult to sharpen with a little practice. If you are left-handed, keep in mind that regular single-bevel knives are meant for use in your right hand only — left-handed single bevels are rare and expensive. 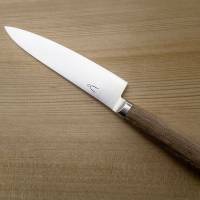 For the typical home kitchen, however, the knife or knives you use the most should be either all stainless steel or hagane-clad stainless steel with double bevel blades. If you want a sturdy knife that can do everything from breaking down meat or fish to chopping vegetables, go for a chef’s knife, which is called a gyūtō (cow knife). If you prefer lighter, thinner knives, a santoku bōchō is a great choice. Santoku means “three virtues,” indicating that it can be used for meat, fish and vegetables. Another useful blade is a smaller version of the santoku called a petty knife, which is great for fine cutting tasks or general chopping, especially if you have small hands. Serrated bread knives are popular in Japan these days, too. 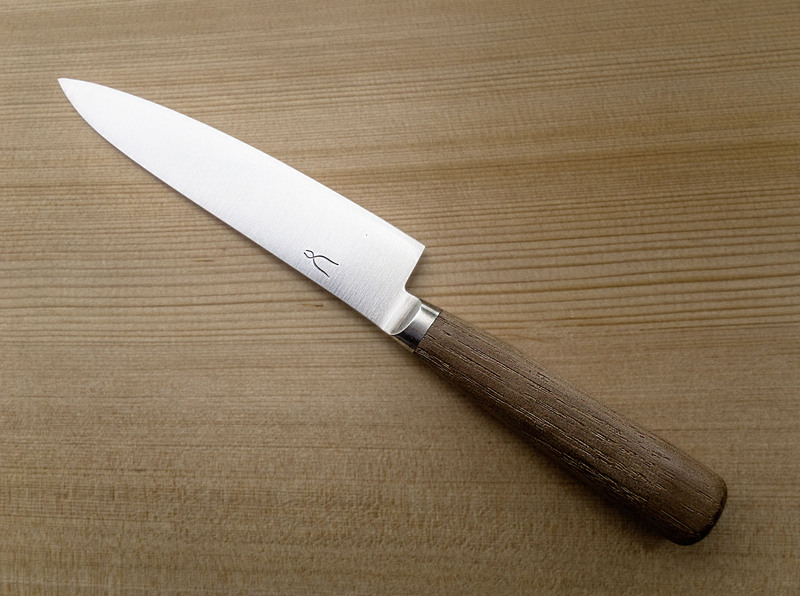 My fourth favorite knife is the nakiri or vegetable-cutting knife, which has a square, thin, double-bevel blade. 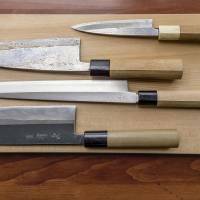 Other knives include the deba, a single-bevel pointed knife that’s used for breaking down fish and meat; a smaller version of the deba called the ajikiri, used for small fish like Pacific saury (aji); and the long, thin, elegant yanagiba (willow blade), with which one can delicately slice fish for sashimi and sushi. And while the sky’s the limit when it comes to the price for a top-quality, hand-forged knife, you can get decent quality ones for just few thousand yen. By far the best knife-related investment you can make, however, is learning how to properly sharpen your blades. I use a #1000 or #1500 whetstone for sharpening, and a #5000 for polishing the blade — this combination works for all my knives. Online sharpening how-to videos are a place to start — or better yet, get someone to show you how. This is the first in a six-part series exploring traditional and modern equipment connected to Japanese kitchens.